What Is the Charles Schwab Cup? The Charles Schwab Cup is a points-based competition that runs throughout the season on the Champions Tour. Think of it as the senior tour's equivalent to the PGA Tour's FedEx Cup. The Charles Schwab Cup is named after the financial services company that is the title sponsor, and has been since the founding of the competition for the 2001 Champions Tour season. Prior to 2016, the points chase was season-long, with points awarded in the same manner over the course of the full schedule. Beginning in 2016, the format switched so that the points chase culminates in a 3-tournament "playoff series," with weighted points at the end (more on this below). Langer is the only golfer to win the points race more than twice, while Lehman, Roberts, Haas, Watson and Irwin are two-time winners. Dominion Charity Classic: 72 golfers (top 72 on the money list), plus, possibly, one wildcard — a golfer who is outside the top 72 in money but finishes in the top 10 of the preceding tournament. As noted above, eligibility for the playoffs is based on the money list. Prior to the first playoff tournament, each golfer's earnings to that point in the season are converted to points, on a 1-to-1 basis (that is, $300,000 season winnings equals 300,000 points). In the first two playoff tournaments, a golfer's earnings in each event are worth double points, and those points are added to the previous total. So a golfer who started with 300,000 points, and then wins $100,000 combined (which converts to 200,000 points) in the first two tournaments then stands at 500,000 points. Prior to the season-ending Charles Schwab Cup Championship tournament, points are reset. The reset takes place in such a way that the Top 5 players in the rankings are guaranteed to win the Cup if they win that final tournament. But all players who make the final tournament are mathematically capable of winning the Cup. The winner also receives the handsome trophy that is pictured in the photo above. The trophy is a golden cup designed by Tiffany & Co. Through 2015 — when the points chase was seasonlong (before the introduction of playoffs) — the Champions Tour points chase went down to the wire (the season-ending tournament) every year but two. Only in 2002 and 2014 did a golfer clinch the Charles Schwab Cup title early. Hale Irwin clinched it in 2002 in the 32nd of 35 tournaments on the schedule. 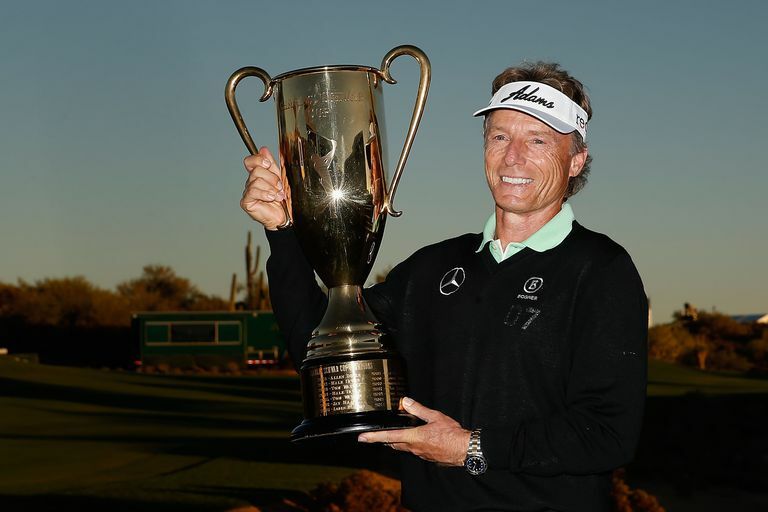 And Bernhard Langer clinched it in 2014 in the second-to-last tournament. The closest points race to date was in 2008, when Jay Haas edged Fred Funk by 12 points. The widest margin of victory thus far occurred in 2003, when Tom Watson finished with a 1,370-point margin over runner-up Jim Thorpe. What Do You Need to Know About the PGA Tour?